Ever since our vacation to Disney World, Noah has gotten terrible with his sleeping habits. Lately every night is like pulling teeth. He screams when it's bed time...even if we push back bed time till 10. It doesn't matter if it's 8:30 or 10, it's always a challenge. His latest dilemma is that he is afraid of the dark. I'm not sure when this came about but this is what he is saying he is afraid of. To fix this problem we bought him a new night light right by his bed. This hasn't helped at all. Noah will stay in his bed till about 2AM and then he creeps into our bed. It's not a snugly experience, but more like getting beat up in the middle of the night! He kicks constantly and makes random hand movements which feels like he is hitting you in the face. It makes for a great sleep...not. This past week, Noah woke up with quite an elaborate story. He woke up with a few swollen bites on his leg and had an interesting story to tell about. "Mommy, Jar Jar Binks came into my room and drug me by the leg from my big boy room to my baby room!" he explained. 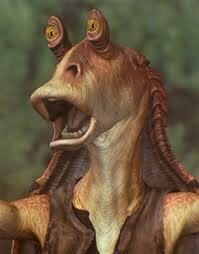 First off, I had to google who Jar Jar Binks was. Clint had to explain to me that Jar Jar Binks was actually a good guy. Hmm. Quite the dream. Last night was no better with Noah. Around 2AM he came into our bed and kicked me like crazy! It's rough sleeping I tell you. Not to mention that you are woken up every few minutes by it. Around 4AM, Clint put him back in his bed. Noah then whined for over an hour. I didn't know the solution, so I took Noah into the den and put him on one of our couches while I took the other couch. Ahh, at least I had a bit more of sleep. Hopefully my next blog update is about how well Noah is sleeping, here is to wishful thinking!